When our loved ones age and get sick, they often require careful medical attention and constant personal assistance and supervision. While family members would like to be there for their elderly loved ones as much as possible, busy lives make constant supervision and care simply unrealistic. For such Maryland families, nursing homes or other long-term care facilities are a good option... or the only option. Such facilities offer a safe environment with staff trained in elder care that can provide the attention, both medical and personal, that our elderly loved ones require. For the most part, the staff at these facilities is fully responsive and sensitive to the needs of the patients. But, clearly, there are stunning exceptions. Sometimes, the staff may become impatient or frustrated with the facility’s patients and lash out at them in the form of threats or worse, physical abuse. Since the facility’s patients are already old, sick and weakened, such abuse can have horrible consequences, both emotional and physical. Such physical abuse may also come in the form of patient-on-patient threats or violence, with similarly terrible repercussions for the victim. No matter the perpetrator of the abuse, it is always traumatic for the victim. What is an “Assault and Battery”? 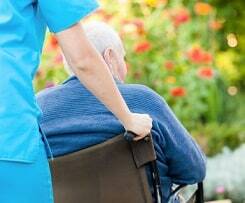 What Are Some Types of Abuse That May Take Place in a Nursing Home Setting? What Exactly is an “Assault and Battery”? We talk about nursing home abuse as treating residents poorly. The actual definition of abuse is more narrow. It hinges on intent. Abuse is on purpose. Neglect is not caring enough to commit the time or resources to do the right thing. Classic nursing home abuse is physical. There are times when the nursing home staff reaches a critical mass where they physically lash out at a patient. This is a classic assault and battery. Historically, these were considered separate crimes, with battery requiring that the aggressor physically strikes the victim and assault requiring that the aggressor scares the victim with imminent violence. Today most states do not bother to distinguish between the two crimes and often refer to crimes of actual physical violence or offensive/harmful physical contact simply as “assault and battery”. How does this manifest itself in a nursing home? Much like abusive adults with children: a punch to the face, a kick to the leg, an uninvited hug from behind or the insertion of a needle into a patient’s arm without the patient’s consent. It is important to mention that while assault and battery is a crime punishable by jail, it is also a civil offense or tort which can form the basis for a monetary claim or lawsuit. Thus, when a patient in a nursing care facility is injured by an assault and battery, there is a claim for financial damages that is entirely separate from any criminal charges that may be brought against the perpetrator. Types of Assaults and Batteries That May Take Place in a Nursing Home Setting? A staff member becomes frustrated with an increasingly belligerent patient and shoves the patient onto the floor, injuring the patient’s hip. A staff member becomes upset at a patient’s unwillingness to eat, and forces food down the patient’s throat, causing the patient to choke. A patient becomes agitated, and while staff is not paying attention, punches another patient on the side of the head and knocks that patient to the floor. Maryland: $800,000 Settlement. A settlement of $800,000 was reached between an elderly woman's family and a nursing home when the plaintiff, age 68, was assaulted while a resident of Defendant Harbour Inns' nursing home in Baltimore. Plaintiff, who suffered from Alzheimer's, was allegedly raped by another resident and physically assaulted on multiple occasions by other residents. Plaintiff reportedly suffered psychological injuries and numerous physical injuries. Massachusetts: $450,000 Verdict. The Plaintiff, age 86 who suffered from Alzheimer's disease, was a patient at Kindred Nursing Centers in Massachusetts. The Plaintiff alleged the defendant nurses assaulted and battered him while he was a resident at defendant nursing home. He claimed he was treated harshly, called names and had his testicles grabbed and twisted while he was being bathed. Virginia: $175,000 Settlement. This wrongful death action was brought after an 82-year-old female, who suffered from Alzheimer’s disease, died at the Defendant nursing home where she was a patient. The plaintiff contended that the defendant's staff failed to prevent her from wandering into another resident's room and being assaulted by the other resident, which resulted in a hematoma and death. The plaintiff argued that the nursing home failed to properly train its staff to ensure that patients do not assault each other. Our law firm has won substantial verdicts and settlements for victims of malpractice, including victims injured in nursing homes. One of the most common and tragic causes of these injuries is physical assault against patients. If your loved one was harmed in this horrible manner, please contact us immediately at 800-553-8082 to find out if you have a claim or get a get a free case evaluation online. Close but not quite as evil as physical abuse: financial abuse of elders.